Are you in for an adventure? Rafting is not only an activity full of action but from the river, you also have a fantastic view of the jungle. We take you to Mariki, the starting point of your adventurous water cruise (rafting) on the Wampu river. 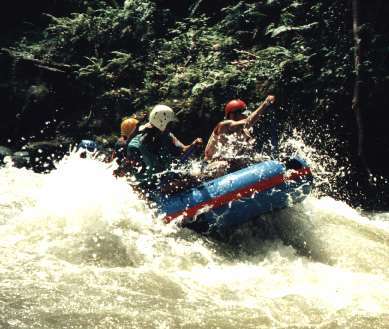 The rafting trip on a special rubber raft is a fascinating experience. The wide Wampu is narrow at certain points, resulting in second-degree rapids. During the rafting experience, you will be joined by two experienced guides. The journey takes about 4 hours. The minimum age for rafting is 10 years. You will enjoy the beautiful nature, navigating on a wide jungle river in the middle of the untouched rainforest. Everywhere around you, you can see the beautiful tropical flora and fauna of the jungle of Sumatra. Halfway the rafting tour, you will stop at a waterfall where you can swim and where a delicious lunch will be served. Lunch is included. After lunch, you will continue for another 2 hours to the bridge at Bohorok. After arriving at Bohorok, you will be brought back to your hotel. Ask us about the possibilities and prices or this rafting trip through the jungle.